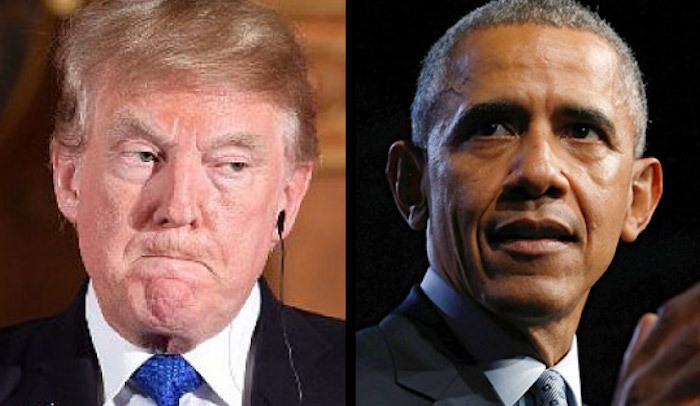 President Trump has slammed Barack Obama and his lawless administration for “spying” on his presidential campaign, claiming that the surveillance abuse committed by Obama, John Brennan and James Clapper may be considered “treason,”, according to audio tapes obtained by the Daily Mail. According to President Trump, Barack Obama was fully aware his appointed CIA chief John Brennan and director of national intelligence (DNI) James Clapper were conducting surveillance on citizens, specifically members of his campaign. “Let me put it this way: if the shoe were on the other foot, and the same thing happened to him, it would be treason and they’d be locked up for 100 years,” said President Trump. Corey Lewandowski, Trump’s campaign manager, and David Bossie, deputy campaign manager and part of the transition team, sat down with Trump for a 45-minute interview, covering a wide-range of topics, including the Russian collusion investigation, fake news and his strained relationship with Obama. In an author’s note, Lewandowski and Bossie write: ‘In several documents pertaining to the FBI’s Crossfire Hurricane investigation, meetings between the FBI and top members of the Executive Branch are discussed. ‘In most cases, the names of all individuals who attended these meetings are listed and unredacted, with the exception of one. The FBI’s Crossfire Hurricane investigation sought to uncover ties between the Trump campaign and Russia. It later would morph into the Russia probe being overseen by Special Counsel Robert Mueller. The initial probe was established on July 31, 2016, and the code name was a line from a Rolling Stones lyric at a time when Trump was firing up his supporters to the 1968 hit song Jumpin’ Jack Flash.